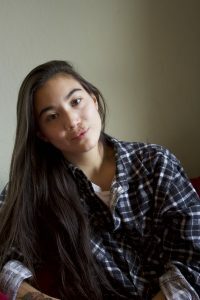 Jane Komori, PhD student in the History of Consciousness program at UC Santa Cruz, works on the relationship between Nikkei, or Japanese Canadian cultural identity, Japanese nationalism and imperialism, and Canadian settler colonialism. She utilizes plant ecologies as a guiding principle to understand the links between these. This summer, a THI Summer Research Fellowship gave Komori the opportunity to travel to Japan, where she studied farming and art practices, volunteered on an organic community farm in Saitama Prefecture, and visited other organic farms in the region, including the first contemporary organic farm in Japan. Congratulations on your THI Summer Research Fellowship this year! How did you use this support? How do organic farming, suiseki, and shizen saibai relate to your research? I consider these farming and art practices alongside similar practices of growing and making in Japanese Canadian communities. My goal is to better understand the way in which seemingly mundane work in the Canadian Nikkei community, from collecting rocks to growing vegetables, are delicate and constantly changing negotiations of the incommensurability of the Japanese term shizen and its English counterpart, “nature.” My fellowship was therefore an opportunity to investigate the ways that the Canadian settler colonial context, which Nikkei people have both been complicit in and resisted at different historical moments, shape Japanese Canadian cultural practices, at the same time that Japanese Canadians negotiate their relationship to Japanese imperialism and nationalisms. Most importantly, the fellowship allowed me to complete fieldwork that provides a strong foundation for one of the primary goals of my work both within and beyond the university: to refigure Japanese Canadians, and Asian North Americans more broadly, in struggles for decolonization. Can you describe the day-to-day of your research visit? I worked for two weeks at Gabare Hiroba, an organic community farm in Saitama Prefecture, and visited several other organic farms in the region, including Ohira Farm in Tokyo, the first contemporary organic farm in Japan. Through my work on these farms, harvesting, weeding, seeding, feeding livestock, and completing other routine farm tasks, I was able to work alongside skilled farmers, apprentices from a local agricultural university, volunteers from local middle and high schools, consumers, and seed suppliers. During my fieldwork, I also met with several academics working on topics such as co-operative farming, organic agricultural histories, and the teikei system, the model for “community supported agriculture” programs that are now commonplace on organic farms across North America. Through participant observation and unstructured interviews, I learned about a number of perspectives on organic farming in Japan and its relationship to nationality, nationalisms, and imperialism and colonialism. Were there individuals who stood out to you during your research? Drs. Yuko Kubota and Mizuki Yamauchi allowed me to participate in seminars, documentary film screenings, and public discussions at Kokugakuin University. And significantly, I met with Isao Noguchi, founder of Noguchi Seed Company, one of the only organic seed companies in Japan, and a leading voice in the shizen saibai movement, as well several farmers who purchase seeds from him and practiced shizen saibai on their farms. t.
In our conversations, Noguchi and his patrons articulated an understanding of Japan as providing the unique conditions for shizen saibai, an agricultural practice that does not employ conventional organic farming methods, including tilling, irrigation, and other soil amendments. Japanese soils were described in our conversations as uniquely rich, and Japanese seeds as uniquely able to thrive without any more intervention than scattering them in the field. Further, Japanese farmers alone were considered able to perform this kind of farming because of their national and cultural identity. The starkness of these nationalist articulations, in particular the deployment of the term shizen to define what is natural to Japan and Japan alone, stood out to me as something requiring further attention in thinking Japanese nationalism, imperialism, and colonialism. How did you think with and through this nationalism? Thinking alongside Julia Adeney Thomas’ work in Reconfiguring Modernity: Concepts of Nature in Japanese Political Ideology, I investigate the problem of translating between the ideologically freighted term shizen and Canadian notions of “nature,” evidenced in some of the Nikkei art and farming practices I examine. The aporia opened up in this work of translation is fruitful ground for me; both terms are frequently deployed not only to describe certain landscapes and beings, but to govern by imposing and defending the boundaries of the “natural.” Shizen is also shown by Adeney Thomas to be central to imperialist ideology and politics in Japan, while concepts of “nature” have played their own unique role in Canada in the dispossession of Indigenous peoples and the creation of a settler colonial state that imagines a terra nullius, or “no man’s land,” as the ground upon which it has built itself. As part of my fellowship research, I turned to articulations of shizen and “nature” in Japanese Canadian diaspora to gain a fuller understanding of how these political ideologies undergird agricultural practices and their renegotiations in the diaspora, and to provide insight into the logics of both Japanese imperialism and Canadian settler colonialism. Where did this thorough, primary research lead you? The outcomes of my research have been multiple. I am currently completing a paper about the material described above. I have organized a panel [that] includes this paper and is now under review for [the Association of Asian American Studies 2019 conference]. The panel, like my paper, is concerned with new readings of Japanese North American art and community formations that highlight practices of resistance in settler colonial nation-states like Canada and the United States. The fellowship allowed me to make the investigations necessary to convene a panel that seeks to reposition Japanese North American cultural practices in ways that (re)open opportunities for alliance with Indigenous peoples of North America, and other diasporic peoples who seek sanctuary on these lands.